Snapchat filters have grown increasingly popular since their introduction in 2015. But if you’re new to Snapchat, you may be confused about how to use filters on Snapchat. However, once you start, filters can prove addictive. So, how do you use filters on Snapchat? And what’s the difference between filters, geofilters, and lenses? In this article, We explain everything you need to know about using Snapchat filters. Let’s start by determining exactly what Snapchat filters are. They’re simply another form of personalization, allowing you to add elements after taking a snap. Think of them as turning your photos into tiny works of art. What’s the difference between a filter and a lens? Some people use them interchangeably. However, the latter is applied to videos, typically during recording. Lenses use augmented reality to customize your face with animated features. They’re generally activated on your front-facing camera. The popular dog lens, for instance, gives faces big ears and a floppy tongue; while another gives you a crown of butterflies. Filters are more static. You can tweak imperfections, change color tones, and add graphics. If you toggle your smartphone’s settings, you can also easily tell people where you are. It’s really easy to access a range of filters. Just open Snapchat, assuming you’ve already got an account. It’ll automatically take you to your camera. Click on the tiny circle (which might display your Story if you’ve recently added a snap) in the top left corner of the screen. Do you know how the Snapchat score works and how to get your points up? Let us show you how to improve your Snapchat score. Tap on the cog in the top right of your profile, which opens your Settings. Next, go on Manage > Filters. Toggle this so it’s on. 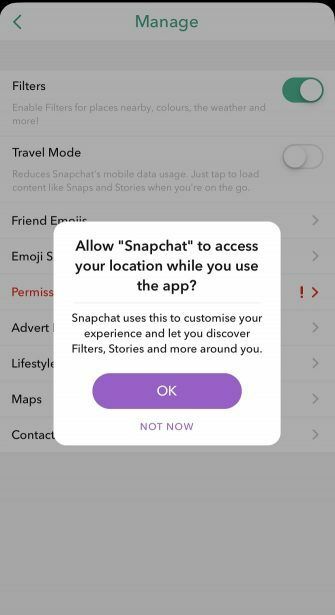 It may ask you whether you want to grant Snapchat location services. It’s up to you, but doing so will give you access to more filters (we’ll come back to this later). Return to your camera by clicking back or relaunching the app. You can then test your filters by tapping anywhere on the screen. A series of circles will appear either side of the button you normally use to take a snap. You can swipe either way to apply a filter to your photo. Some Snapchat filters activate depending on which camera you use, or what’s on your screen. For most, you’ll be told to “Find A Face”. If you’re just testing the feature and are camera-shy, why not find a photo of your favourite celebrity online and see what they look like as a cowboy? Once you’ve applied a feature you like, press the circular button as normal to take a snap. You can add further customization, but again, we’ll come back to that. Beware: some Snapchat filters are seriously odd, while others are good fun. Don’t be afraid to try a few out with mates you trust won’t screenshot them! What Are Geofilters on Snapchat? Geofilters use the same concept but are determined on where you’re located—so yes, you’ll need to give Snapchat access to your location. If you’re on iOS, go to Settings > Privacy > Location Services > Snapchat and select “While Using the App”. Android users should go to Settings > Location > Turn on. Geofilters change, just as normal filters do. Typically, they highlight a place name and add some form of illustration too. Once location-based services are enabled, you can access geofilters the same way as the others: tap on the screen and swipe left and right. You might’ve heard about on-demand geofilters too. Snapchat encourages people to make their own filters—mainly because it brings in some cash—so on-demand means you can create a geofilter for a specific place and time. Sounds like a rip-off? It is, if you solely use Snapchat for leisure. But if you’re a business, it could be a useful marketing tool. How Can You Further Personalize Snaps? Once you’ve taken a snap or video using your chosen filter, you can customize it further. Clicking once on the image will allow you to add text, but there are other options available in the top-right of the screen. The pencil icon lets you draw over the image, the paperclip adds a URL, and the stopwatch lets you change how long recipients can view your snap for. However, the closest you can get right now to adding another filter is the Stickers button, which looks like a sticky note being peeled back. This adds a GIF or bright image to your photo and they’re somewhat akin to geofilters because they alter depending on time. Ever wished you could use a personalized cartoon image on social media? Thanks to Bitmoji, it’s easier than you think.
. It’s another way of making sure Snapchat doesn’t grow stale. Can You Create Your Own Snapchat Filters? You can create your own filters, but they cost! If you swipe far enough, Snapchat will promote a service which lets you create your own filter. Why? You might want a special one for a big night out, a celebration, or for a place. You can do this online via create.snapchat.com, or in the app by clicking on that cog in your profile then Filters and Lenses. However, filters need to be approved. Don’t make one for someone’s wedding if the big day is tomorrow. The company generally takes roughly a day to review filters, but we’d advise you give more leeway than that. The price varies depending on the location and duration of the geofilter. Fees starts at $5, which is reasonable, although you are effectively throwing cash at something that will disappear. Admittedly, you can screenshot snaps or save them to My Memories, so all is not lost. Either way, Snapchat filters last a minimum of 30 minutes and can cover between 5,000 and 5,000,000 square feet. Experiment With New Snapchat Filters! So, now you know how to use filters on Snapchat. But Snapchat filters change all the time, so the best way to master them is simply to test them all out. Most are self-explanatory and just require you to follow the on-screen instructions. The point is to have fun with Snapchat filters, as that’s why they exist. who fall too far down the rabbithole. With that in mind, look up once in a while. Explore more about: Location Data, Snapchat.